Me to Mike this December: Remember that picture of peppermint marshmallows you sent me last year? I think I’m going to make them. Mike: Great – they look incredible! Mike to me, as I was making the marshmallows: You mean you can actually make marshmallows?? I could spend my time wondering what goes on in my husband’s head, and what he actually thought was going to happen when he sent me the picture of peppermint marshmallows. But I prefer to spend my time eating these delicious sugary treats. I had no idea making marshmallows would be so easy. Or that they would taste so good! They have a lighter, airier texture than store bought marshmallows. I added peppermint extract to mine which makes them perfect for Christmas. They are absolutely incredible when added to hot chocolate. They melt quickly and infuse the whole drink with sugary peppermint goodness. Mike and I both decided these would be a new holiday tradition! *Personal notes: I modified the size of the pan from an 8×8 to a 9×13. I tried to use an 8×8, but they overflowed the pan and I had to use various extra containers for all the extra marshmallow goo. I think a 9×13 would be perfect. Also, I like the red marbling, but it’s only on top of the marshmallow. When I make these next year, I will probably add some red food coloring to the marshmallow mixture as it’s mixing to tint the whole thing pink. Coat a 9x13 pan with cooking spray. Line the bottom with parchment paper and coat the parchment with cooking spray. Set aside. Put sugar, corn syrup, and 3/4 cup water in a small saucepan. Cook over medium heat, stirring, until sugar is dissolved. Stop stirring and let the mixture come to a boil. Raise the heat to medium-high and cook until mixture registers 260 degrees on a candy thermometer. 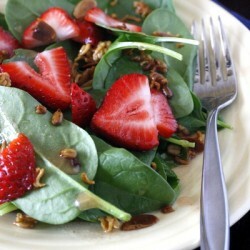 Meanwhile, sprinkle gelatin over 3/4 cup water in a heatproof bowl; let stand 5 minutes to soften. Set the bowl with the gelatin mixture over a pan of simmering water. Whisk constantly until gelatin is dissolved. Remove from heat, and stir in extract. Set aside. Beat egg whites in the bowl of an electric mixer fitted with the whisk attachment until stiff (but not dry) peaks form. Whisk gelatin mixture into sugar mixture. With the mixer running, gradually add the sugar/gelatin to the egg whites. Mix on high speed until very thick, 12 to 15 minutes. Pour mixture into lined pan. Working quickly, drop dots of red food coloring across surface of marshmallow. Using a toothpick, swirl food coloring into marshmallow to create a marbleized effect. Let marshmallow stand, uncovered, at room temperature until firm, at least 3 hours or overnight. Cut into squares. (Scissors seemed to be the easiest way to cut these). Roll the cut marshmallows in powdered sugar to prevent sticking and store in a ziploc bag or airtight container. Wow Megan, these look amazing! So pretty and so easy! Oh Megan! These look wonderful. I'm thinking this would be an awesome gift for friends with a mason jar of spiced cocoa. Oh yum! I've seen lots of posts over the last year for homemade marshmallows but you do truly make it seem easy. These marshmallows look so fluffy and yummy! I've never tried making them before, but they looks so festive that I'm going to have to try. Thanks for sharing! 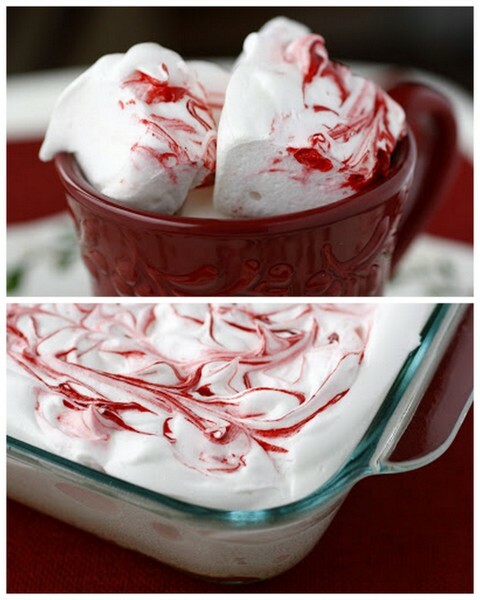 I have really been wanting to try making marshmallows this season – great idea to add the peppermint! Can't wait to make 'em! Oh my goodness Megan, they're so pretty! I can imagine how delicious they are in some yummy hot chocolate! Ok, Megan, you must stop these sorts of posts! I think I've gained 10 pounds just visiting your site in the last week!! LOL YUM! I never understood people making their own marshmallows….until I saw this! OMG these look incredible! homemade marshmallows are always divine, but these are too pretty to eat. Lovely! I've been interested in trying marshmallows for a while now — I'll have to add them to the list! Amazing. Those are awesome. I bet they add a nice bit of minty goodness to a hot cup of chocolate, yum! I can't wait to make these! They look great! Oh dear. You have just changed my life. In a GOOD WAY. They look fantastic and now I have to add marshmallows to the list of must tries. Love them with the peppermint! These are beautiful! I've been wanting to make marshmallows at home for a while now. Thanks for sharing! 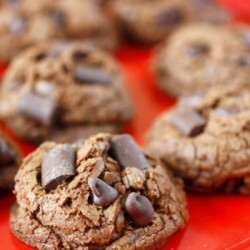 I wanted to let you know that I made these last night and tried them tonight in hot chocolate. The only word to describe them is amazing! Thanks for the great recipe idea! Maggie – I'm glad these turned out well for you! I hope everyone at your party agreed 🙂 Thanks for stopping back to comment! Thank you for the inspiration. I actually made marshmallows for the very first time and I loved it! I used Alton Brown's recipe that's very similar to the one you sued from Gourmet. And I did the red food coloring, too. Loved it! Lovely blog you have. I'm not sure why but I have this weird fear of making marshmallows. I need to get over it because these here look delicious and like they need to be a part of my life. I made these as part of my Yankee Swap gift for work. Thanks for the recipe, never realized how easy these would be. They came out lovely, I know they'll be the gift everyones fighting over too! Every Christmas I commit to trying something new for gift giving from my kitchen. I've been eyeing marshmallows for a while and your blog inspired me to go for it. I made 4 batches yesterday and am so glad I did! I am putting them together with my homemade cocoa mix I give to friends for Christmas and am so excited about saving some for my kids. Thanks for sharing! I just tried these out for a last minute add to some hot cocoa mix for Christmas too — they are amazing! (I'm happy I have some left over for us). I used a Pampered Chef pizza cutter to cut mine and that worked really well. Any idea how long these are good for or if they weep? 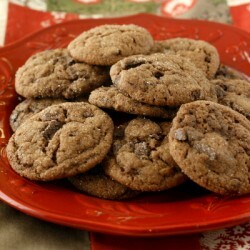 I’ve never made them before and was thinking of trying them and shipping them with some cocoa. Thanks!! 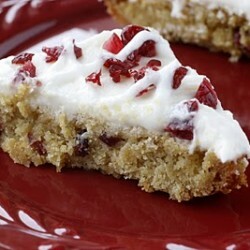 I came over here from Money Saving Mom’s post about your delicious cranberry bars and have found a wealth of yummy recipes. I can’t wait to make the bars for a ladies Christmas Party and gift swap at church. 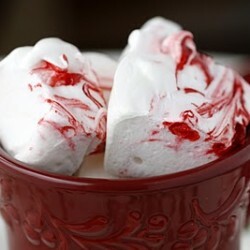 These marshmallows will make the perfect (and inexpensive) gift!!! After making these, I don’t think I want to ever eat another store bought marshamallow!!!!! These marshmallows are so squishy and soft and melt marvelously in hot chocolate. I have been handing these out as gifts and everyone is so excited to get home made marshmallows! Thanks for your great recipes, I feel like such a superstar this year because of the marshmallows and cranberry bliss bars! So many great uses for this one. Can’t wait for the holidays! I’ve been meaning to try these marshmallows for some time, and now that I finally have a candy thermometer, I was excited to give them a go. The sugar mixture took forever to come up to temp, 15-20 minutes at high heat, boiling away, don’t know if this is normal? Then as it sat, it crusted over, as I feared, then turned white and started to get hard, so I had to scrape it out of the pan and mix it with the gelatin early, to prevent hard candy forming in the pan. The gelatin smelled bad while heating, like wet cat or animal hair (maybe I overheated it?) The egg whites took longer than usual to get whipped, at least 30 minutes of aggressive beating, still they hadn’t formed real peaks. I stirred in the gelatin mix anyways, hoping that would give it some volume, and had to constantly scrape the sugary goo down the sides of the bowl, where the mixer was slinging it all. I mixed it till frothy and sort of thick, didn’t have the patience by then for beating it a full quarter hour as instructed. I scraped and plopped it into the glass pan, and it refused to spread, like a pile of rubber in the middle, snapping back into place each time. I melted it, which made it pourable and spreadable, but the green food coloring I used (which I added while still in the bowl) melded into it and produced a sickly green color. Stirring it deflated it, and the final result was like melted mint ice cream, making a thin layer on the bottom of the glass dish. Quite a sticky mess to clean up now, and what I tasted out of the bowl was nothing to rave about. Slicing it out of the pan was more like dealing with strips of soft, sticky rubber than any marshmallow I’ve known. Humbling experience, but I think I’ll leave marshmallow-making to the pros and the more fortunate. Definitely not what I would call easy to make though, even if all went well. Very time-consuming too, I think I spent two hours total. A shame, since the photos look good (waaay better than mine) and I love the recipes you share otherwise. This just isn’t for me it seems. Hope others have better luck, if they feel up to this.